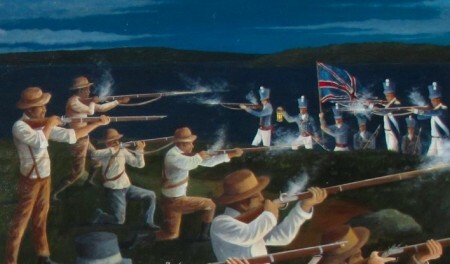 The Battle of Troupesville, now called the Battle of Sodus Point, occurred on the crest of a hill (now the intersection of John and Bay Streets) on the evening of June 19th,1813 during the War of 1812. A group of approximately 50 patriots (a combination of poorly trained militia and local volunteers with no military training) fired into the lines of advancing British marines as they ascended the hill from the western shoreline. Although greatly outnumbered and fighting some of the best trained and battle hardened soldiers in the world, these brave Americans had the courage of their convictions to defend our village from the British incursion. Unaware of either’s fighting strength and numbers, both British and American forces retreated; Britons to their ships and Americans to the heavy underbrush. The next day after a barrage from the cannons on their ships, the enemy landed once more. The British marines seized some stores in the warehouses (most provisions had been hidden in a nearby ravine the previous night) and burned most buildings in the village. Only one building, a tavern known as the “Mansion House”, survived the battle. This building was spared conflagration due the repeated efforts of commanding British naval officers who used the tavern to place fatally wounded American, Asher Warner who died later that day. Another American wounded during the battle was Charles Terry who died from complications of his wounds a few weeks later. Two British Marines are known to have been killed during the battle. Privates Job Allen and John Whammond of the 1st (Royal Scots) Regiment of Foot -1st Battalion died of wounds suffered during the battle according to the War of 1812 Casualty Database. The mural is dedicated to the bravery of those early patriots who defended this village and, it is hoped, whose courage may serve to inspire future generations.